NHL All-Star Weekend has always held a special place in my heart. My feelings about a skills competition and an exhibition game in which there’s no physicality, defense or anything that resembles NHL hockey other than nasty dangles are probably unshared. But when you’re a kid growing up with stars like Wayne Gretzky, Mario Lemieux, Ray Bourque and Brian Leetch and watching them wear those black and orange gems each winter on a weekend afternoon, it’s something that stays with you. Even though Sidney Crosby and Evgeni Malkin weren’t in Columbus this weekend and Henrik Lundqvist was home in favor of goalies of much lesser abilities (Hi, Jaroslav Halak), I still watched and still paid attention to the 60th NHL All-Star Game, the first in three years. Well, I paid more attention to the skills competition than the game, but I still paid attention. And since I don’t always agree with the selections for the All-Star Game, a couple of years ago I decided to build my own version of an All-Star team. The one difference is that this team is built up of players I don’t like. Welcome back, once again! After leading the 2012-13 team and 2013-14 team, Lucic is back on the 2014-15 team. The Bruins have cap issues and because of this, Lucic could be playing for another team in 2015-16, and judging by every team’s eagerness to give out bad contracts and throw money at any and every free agent, teams will be lining up to offer Lucic a big payday. If he plays himself out of Boston and off the Bruins, there might not be a place for him on the All-Animosity Team going next year, but his three-year run on the team will always be a memorable one. My animosity toward Ovechkin has declined since Sidney Crosby officially won the Crosby-Ovechkin Debate (which was never really much of a debate anyway) and I no longer have to spend time and energy defending and supporting the best player in the world against a pure goal scorer, who couldn’t care less about what happens in his own zone. In the Road to the NHL Winter Classic on EPIX, Capitals owner Ted Leonsis referred to Ovechkin as the most pouplar athlete of the four majors sports in Washington D.C. and I questioned it at first, but when put against Bryce Harper, Robert Griffin III and John Wall, I agreed with Leonsis. After watching Ovechkin attend the Wizards game in the EPIX series and seeing him act like a normal person and not a four-time 50-plus goal scorer and one-time 65-goal scorer, I actually kind of liked him. And then watching him hope to be the last pick in the All-Star Game to win a free car, despite being possibly the best pure scorer in the world, I actually liked him a little more. I’m a Crosby guy and always will be, but maybe there’s room to be a fan of both? Maybe Ovechkin’s personality is playing him off this team? I’m sure I will be back to being anti-Ovechkin in March when the Rangers and Capitals play again and he spends the entire night taking shots at every Ranger on the ice. Even though I will annoyed, it will put a smile on my face that my animosity toward Ovechkin is back. I had to figure out a way to make room for Brad Marchand on the team and that meant either cutting Alexander Ovechkin or Chris Kunitz. I didn’t cut Ovechkin, even though I actually don’t have as much out-of-game animosity toward him as I do for Kunitz. By “out-of-game” animosity, I mean that I don’t mind Ovechkin when he’s not playing a game against the Rangers, or a playoff game, and putting fear into me every time he’s on the ice or every time the Capitals get a power play. Kunitz, on the other hand, makes me angry to just think about since his career has taken off with the Penguins thanks to playing with Sidney Crosby, yet people continue to consider among the league’s elite players, which was never more true when he was given a spot on Team Canada in the 2014 Olympics. I thought about putting Kunitz on D for this team and sort of making a power-play unit out of the team, but then I decided … actually, wait, that’s a great idea! Put Kunitz on defense and cut Dion Phaneuf, who couldn’t be any more irrelevant as the captain of the downfall of the Maple Leafs. Marchand is the ultimate player who you hate to watch your team play against, but would love if he were on your team. He’s dirty and annoying, he’s a pest and nuisance, but he’s good. Or at least he can be good. There are stretches where you wonder why it looks like he doesn’t care and other stretches where he’s involved in every play and leading an unstoppable forecheck. His lapses in judgment and total disregard for player safety are what makes him hated and in the Rangers-Bruins game on Jan. 15, there he was earning a two-game suspension for slew-footing Derick Brassard (a technique that Marchand turns to frequently). The only thing worse than Marchand’s antics in that game were Jack Edwards and Andy Brickley calling the game for NESN and saying they didn’t see a slew-foot. I don’t know how Chara would feel knowing that on this team Milan Lucic wears the “C” instead of him, but if he were upset about it, I would have no problem throwing an “A” on his jersey for him. Jack Edwards will likely tell you that Chara is the best defenseman in the league, but he’s the same guy who thinks fights are decided by whichever plays ends up on top of the other player on the ice. Is there anything worse than when broadcasters talk about Chara’s 108-mph slap shot in the Skills Competition in a real game? No, there’s not. Because there are a lot of times in real games when you get to sprint untouched from the blue into a still puck in the slot and rip a bomb into an open net. But that’s just the tip of the iceberg that is the lovefest for the 6-foot-9, one-time Norris Trophy winner. The Rangers’ 3-1 series comeback against the Penguins in the Eastern Conference semifinals last year was an amazing five days, in which any shot, bad bounce or deflection could have ended the Rangers’ season a month earlier than it lasted. And aside from the jubilation from watching the Rangers come back against a team that had its way with the Rangers in the postseason forever, came the jubilation of watching Chris Kunitz score once in the series. I moved Kunitz back on D on this team just to keep him on and it was a move I had to make after originally thinking of leaving him off this year’s roster. But the more I thought about him and the more I thought about him putting up stats and getting paid as the product of playing on a line with the best player of this generation, I had to find a way to keep him on the team. When I was in college in Boston, there was a place called New York Pizza next to the Boston Common on Boylston St. that I would always eat at 2 a.m. at the earliest when I wasn’t exactly sober. I swore to everyone that visited me that New York Pizza was the best pizza in Boston and every person I told this to agreed with me because I would take them there after a night of drinking. It wasn’t until one time when I went to New York Pizza in the middle of the day and had a slice and could barely get two bites down that I realized that the alcohol had masked the true taste of the pizza. Chris Kunitz’s career pre-Sidney Crosby was me eating New York Pizza sober in the middle of the day and Chris Kunitz’s career with Sidney Crosby has been me eating New York Pizza drunk. Last year, I said, “I feel like you could stick pretty much anyone and I don’t mean just any NHL player, but rather any actual person on a line with Crosby and they would be good for 15-20 goals,” and I believe that to be 100 percent true. And because that’s true, let’s stop pretending that Chris Kunitz is the type of player that he isn’t. Like last year … was there any other choice? And unless you’re a Devils fan or have changed your stance on the Ten Commandments, then you will agree with Brodeur as the starting goalie once again. Yes, I stole that line from myself from last year. 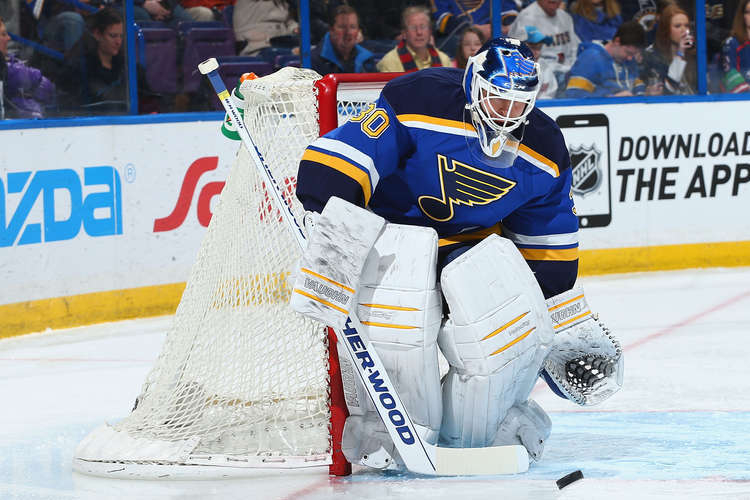 And maybe there were other choices (cough, cough, Carey Price, cough, cough), but with Brodeur set to retire on Thursday after trying to play at the age of 42 for the St. Louis Blues, it made sense to bring him back one more time. Rather than ride off into the sunset as a lifetime Devil, who could have enjoyed a final game in New Jersey last season, Brodeur had to come back this season. After 1,259 games with the Devils, his stats will always have those glaring seven games at the bottom of the list. Sure, he added three more wins to his all-time record of 691 wins, but it’s unlikely that number will ever get touched, so instead of leaving it at 688, it’s now at 691 with a little bit of stink on it. There are some players that are just supposed to play for one franchise forever and Brodeur is one of those players, considering he has been on the Devils since I was in kindergarten. Yes, I said KINDERGARTEN! Very rarely does a Ray Bourque-like move work out and instead it just gets weird when someone like Brian Leetch, who was a Ranger for 17 years, ends up playing 15 games for the Maple Leafs and 61 games for the Bruins at the end of his career. I will miss Martin Brodeur when he retires, but my animosity for him will stay the same.